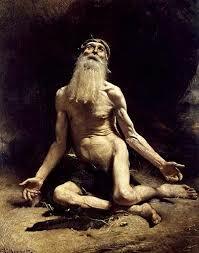 The book of Job is difficult to classify. The person of Job is regarded as a prophet, but the book that bears his name is not like the other books of the Prophets. Possibly this is because the material is organized by someone from a much later time. Job is often classified as a wisdom literature, but unlike other books of wisdom it involves direct debate or disputation among apparently historical figures. The debate probably dates to a later time than Job and his friends actually lived. The author ridicules Job's friends as people from the desolate wilderness who live in the clefts of the valleys and in the caves. They are portrayed as donkeys braying among the bushes (Job 30:3-7). This is not how Job himself would have regarded his kin. We can be fairly certain that the author of Job was not someone who lived in Arabia or even in that part of Canaan that was Horite Hebrew territory. The first two chapters of Job provide a clue as to when the author lived. Here we find a picture of Satan as a "son of God" who has the power to accuse. This suggests an author from the Persian Period, writing long after the time that Job, Eliphaz, Bildad, Zophar and Elihu would have lived. Satan as the accuser was a favorite theme of that period. Job reasons that God is not as his friends describe Him. In fact, a close reading of Job will dispel most notions of God, whether ancient or modern. God is not cruel like the pagan gods. God is not impersonal as conceived by the Deists. God is not deceived, as sinners hope. God is not blind to the suffering and death of the righteous. He recognized the blood of Abel which cried to Him from the ground and He knows of every tear and drop of blood shed by His righteous ones. Nor is God the Divine Arbitrator of karma as in Hinduism and Buddhism. Yet Job never claims to know God's mind. For the righteous, suffering gives way to contemplating the "secret councils of God" (Job 15:8) and to prayer that we might not experience the second death of which Baruch 2:17 speaks: "The dead who are in the graves, whose souls [ka] are taken from their bodies, will give unto the Lord neither praise nor righteousness." Abraham's people believed that the soul and the body must stay joined after death to enjoy eternal life. This is Job's last hope. He proclaims that "I have a living Defender and that he will rise up last [as Job's final witness] on the dust of the earth. After my awakening, he will set me close to him, and from my flesh I shall look on God. He whom I shall see with take my part; my eyes will be gazing on no stranger." (Job 19:25-27 NJB) In Job 13:16, Job declares that his trust in God as his salvation (Yeshua = Jesus) will never be destroyed. Job comes to this in his suffering, but his friends are not suffering. For them this life is good and Job's suffering can only be explained has having lost God's favor. They said the same about Jesus in His passion. So we know that Job had Horite blood. The Horites were devotees of Horus who was called "the son of God" and "Horus of 2 Crowns". Uz, Buz and Huz represent a 3-clan Horite confederation based on kinship. The trial of Job in which Satan acts as the accuser parallels Zechariah 3:2-6 where Satan accuses the High Priest Joshua (Yeshua). In that trial God acquits Joshua and commands that he be clothed in clean garments and crowned with 2 crowns (ataroth). This points to Jesus who as the Son of God would wear 2 crowns according to Horite belief. The Horite confederation is not identified as Uz, Huz and Buz, but rather as Dedan, Tema and Buz. The oldest Arabic script emanated from the North Arabian oases of Tema and Dedan in the Hijaz. Tema is known by Arabs as Taima and lies about 70 miles north-east of Dedan. Tema, Dedan and Dumah were caravan stops along the trade route from Sheba to Babylon. The Dedanites were famous for mining. Job's kin shared appearance and life style. They dwelt in hills and built shrines in caves (such as at Petra) and the men shaved their heads (Jeremiah 25:23), as did Horite priests. This suggests that this was a confederation of Horite priestly families. Genesis 36 confirms this, listing Uz's grandson Dedan as a Horite ruler. Here we also find reference to Huz or Husham of the land of Tema (Gen. 36:34). Bildah the "Shuhite" was a descendant of Abraham's son Shuah (Gen. 25:2). Zophar the "Naamathite" was a descendent of Naamah, the daughter of Lamech (Gen. 4:22) who married her patrilineal cousin Methuselah (Gen. 5:25). The last of Job's kin to speak is the young man Elihu. The name Elihu, which appears only in Job, is a priestly name. In Strong's Concordance Elihu is said to mean "He is my God". However, it is more likely that the name relates to God's Word since El refers to God and Hu was the ancient Egyptian/Horite word for the divine Word that overcomes chaos. This fits the context of the book of Job. Elihu is of the clan of Buz. I Chronicles 5:14 tells us that the son of Buz was Jahdo and Jahdo's son was Yeshishai, the Aramaic form of Yeshua/Jesus. Elihu is the mysterious figure whose speeches fill the last chapters of the book of Job. He was likely the brother-in-law of Judah's grandson Hezron. This suggests that Elihu lived with his father Barachel in Buz but was Ram's heir. Ram was his maternal grandfather and the high priest. (Ram means "high.") This means that Elihu was a ruler-priest and an ancestor of David. It is Elihu who takes us beyond the wisdom of Eliphaz, Bildad and Zophar. He moves us from the retributive justice of Job's 3 friends to the reality that "God is greater than any human beieng. Why then quarrel with Him for not replying to you word for word? God speaks first one way and then in another, although we do not realise it." (Job 33:12-14NJB) Elihu's 230 line discourse elaborates and illustrates how this is true. Job and all his friends are descendants of Enoch, a man who is commended for his faith in Hebrews 11: 6. Each had his own answer to why Job ws suffering, but only the suffering Job glimpsed something of the mystery of God's counsel. As a man of faith, Job remembers that "God watched over me" (Job 29:2) and that "the friendly counsel of God was over my tent" (29:4), and this sustains him in his suffering. Those who accuse him are his own kin, as was true with our Lord Jesus. Their accusations are the same as those used by the Jewish rulers to accuse Jesus, the Righteous One. The central message of Job is to remember God at all times, even as we hope to be remembered in the eternal Kingdom. It is to love God whether enjoying life or afflicted, and to look to Jesus Christ, the Author and Finisher of our faith. In this sense, Job is a prophetic book which presents wisdom of the deepest kind. Patrick Henry Reardon recognizes that Job moves toward the "Bible's apocalytic principle", that is to say, "More is happening than seems to be happening." (The Trial of Job, p. 46). Thank you, Alice, for this timely posting. I am currently reading my way through the book of Job along with Father Patrick's commentary. Your research is unique and very valuable for a deeper understanding not only of Genesis but also the rest of the Bible. Please keep up the hard work and I look forward to buying your book when you are finished. Elihu was teacher, preacher priest, a righteous voice of truth and correction, but Job also acted and modeled the priesthood..that of a suffering priest and as a mediator priest, when offered sacrifices in behalf of his family in the beginning and at the end of the book, when offered prayers and intercessions for his friends. Jesus commands us to pray for, bless, love, forgive and do good to our enemies. The early church spent one day each week, fasting and praying for their enemies, those (even their own family) who were betraying, torturing and killing their Christian brothers and sisters.